Just four days ago, your humble blogger noted that our mainstream news media, financial commentariat, and blogosphere, have (again) overlooked the key issue, in their reporting of Treasurer Swan’s MYEFO budget update. Once again, they have all overlooked the critical economic risk; the joined-at-the-hip relationship between our Big Four banks, and our government’s financial position, as perceived by the major credit ratings agencies. To wit, back in May this year Moody’s Ratings agency essentially declared our Big Four banks are Too Big To Fail. And in downgrading the Big Four’s credit ratings, Moody’s tacitly warned the government that it must maintain the implicit and explicit government (taxpayer) guarantees propping up the Big Four, else Moody’s will cut their ratings by another 2 notches. By inference, this means that Moody’s was also warning the government that it must achieve and maintain a pristine government sector balance sheet, in order to support the plausibility of its guarantees for our Ponzi banking system. If the government cannot reverse the direction of its ever-rising debt trajectory, and demonstrate a plausible path back to achieving an annual budget surplus (in order to start paying off the gross debt), at some point in the not-too-distant future their failure to manage the debt will be taken as a sign that our government’s guarantees of our banking system are less than reliable. Wayne’s (unreported) MYEFO prediction of a 57% blowout in net public debt this year alone, will only hasten the arrival of that day. As will his blowing through our third increased debt ceiling in just 3 years, by around mid-2012. Inevitably, our banks will have their credit ratings cut further. They will find it increasingly difficult to attract funding from international money markets, upon whom the banks are dependent for around 40% of their wholesale funding. (Indeed, as we saw on Wednesday, the yield spread on Aussie banks’ bonds compared to non-financial Aussie corporate bonds, has just hit an all-time high). Funding costs for the banks will rise. Interest rates for Australian borrowers debt slaves will rise. (Or at the very least, RBA interest rate cuts will not be passed on). Availability of loans to businesses will fall even further, choking the economy. Bad loans (defaults) will increase. Our housing bubble’s gentle 10-month price deflation, will accelerate. Our banks will collapse like the Ponzi house of cards that they are. … will be obliged to bail out the banks, as per the Government Guarantees. Now, we have a further red flag that my Missing The Key Economic Point For Dummies blog was right. Australia’s major banks are confident the first ratings downgrade by Standard & Poor’s in two decades will not have a major impact on their funding costs, despite the ongoing volatility created by the European sovereign debt crisis. … The banks’ ratings were last cut in the early 1990s as the Australian economy struggled with recession. S&P defended the ratings downgrades, which it attributed to Australian banks’ heavy reliance on wholesale funding markets. BBY banking analyst Brett Le Messurier says the downgrade is not too serious but could lead to higher borrowing costs in the long term. Mr Le Messurier says the big four banks still have plenty of liquidity to help them “ride out the current turmoil in Europe for some time”. “In and of itself it doesn’t matter that much, but if another one follows then they get into the “A” category,” Mr Le Messurier said. When it comes to Australia’s banks, don’t listen to the spin. … The moves come about six months after Moody’s did almost exactly the same thing and predictably, just like then, each of the banks have come out today to defend their balance sheets and businesses. But while ratings agencies certainly don’t carry the clout they used to, make no mistake, there are a stream of issues for Australia’s banks. For one, a credit facility from the Reserve Bank of Australia, or RBA, established to help banks satisfy new global banking rules, known as Basel III, are certain to lower each of the banks’ risk-taking possibilities and profits. But actions speak louder than words and when the RBA cut its key cash rate a month ago, NAB refused to pass on the favor in full. If Europe gets worse, and the RBA cuts a few more times, all those banks that today are talking about their strong balance sheets will change their refrain when they decide to hold back on passing those cuts on. You can say all you like about yesterday’s banking downgrade being “anticipated”, “reflecting methodology changes” and not “impacting on consumers” – but down is still down. It’s the wrong direction. … taking a step back from the technical stuff, it’s important to recognise that this methodology change is not some just arbitrary fiddling with numbers. It’s grounded in the very real increase in risk to lenders that has occurred since the global financial crisis struck. The changes stem from the failure of the ratings agencies to identify that crisis in 2007 and 2008. So, in some respects, this downgrade represents the credit agencies doing their job properly – finally. The big shift in the way S&P now looks at banking risk is that it has weighted its focus away from the cyclical ups and downs which are reflected in an institution’s quarterly financial performance and towards the underlying structural risks of a region’s banking sector. So now, S&P is analysing first the structural risks in the Australasian banking system as a starting point, and then assessing the relative position of each bank’s performance within that context. S&P said the decision was based on the cost posed by sourcing cash from overseas markets and the country’s foreign debt. Following the crash of Lehman Brothers in 2008, which S&P failed to foresee, the agency revised its rating criteria – and it is in the context of these new considerations that the banks were downgraded, reports The Australian. Meanwhile, rival rating agency Moody’s said it would keep the banks on their AA rating and retain their outlook as positive. Experts have warned that a continuing European debt crisis could expose the banks to a further downgrade. As noted in Wednesday’s blog, our Net Foreign Debt is yet another key factor that our politicians (on both “sides”) and lapdog media studiously avoid focussing any attention on. Why? 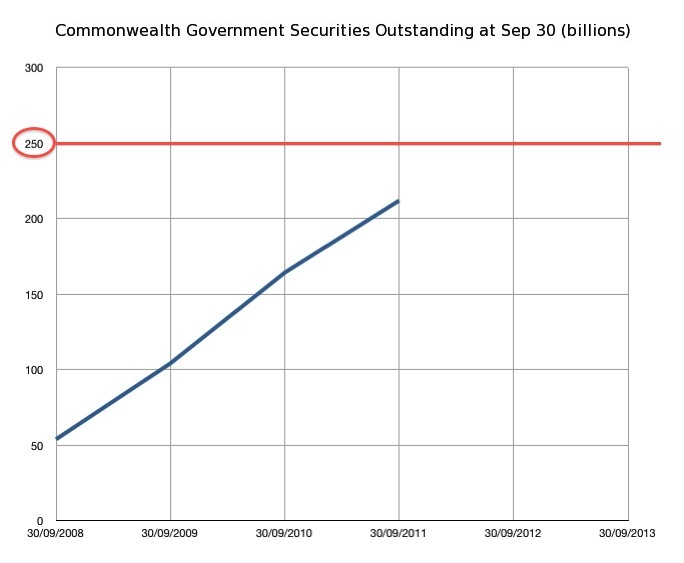 According to the latest RBA data, our Net Foreign Debt at June 2011 was a whopping $675 billion. More than 50% of GDP. So naturally, noone in positions of power want to mention it, even though it is a very serious structural problem, and one that is now fundamental to triggering negative consequences such as this S&P rating downgrade. Break out the popcorn folks. The government balance sheet IS a Ponzi scheme TBI, it has been for a long time. The government cannot ‘extinguish’ its debt through the central bank. What we have is a colossal credit bubble, with government debt at its heart. A black spoiled heart. The consequences are unavoidable, the question is just when the greatest fool bids for his last government obligation. I’m still leaning towards when yields approach zero all along the curve. That is, when bond prices cannot go any higher. Think of it like this. For a Ponzi scheme to get started, Mr Ponzi must offer his fools a good return (yield) but as his scheme gains popularity he can offer lower returns (yields), the flipside to a rising market price for his ‘securities’. There must however, be a lower limit to the returns he must offer in order to attract new fools. If he runs out of fools his scheme fails since it produces nothing of value, he has no assets to sell to maintain the price of his ‘securities’. It’s just like the stockmarket in fact! Very true JMD. My apologies if I frustrate you in failing to remember to point out this fact. If/when I can find a way to simply and easily explain how the process of government debt issuance is a Ponzi, in a way that those wholly unfamiliar with finance can easily follow without all the terminology being confronting, I’ll publish with relish. So,exactly who “owns” the half of us? BTW, I noted that Tony Abbott was asked in his Tele blog last week if he would tell us the full extent of Labor’s debt if he won government. Let’s keep him to that as I doubt the Labor/rabble government will tell us the truth while in office! Speaking of banking downgrades by the corrupt US ratings agencies, and the 37 International Investment banks which were recently downgraded, most/many of which are US Federal Reserve Primary Dealers (but not MFGlobal ’cause they’re already bankrupt-and still looking for billions missing-thanks Mr.Corzine) has any one ever stopped to ponder just exactly WHO are the major shareholders of our “TBTF” solid-as-rock, banks?? The four major shareholders in order are 1.HSBC 2.JPMorgan 3.National Nominees 4.Citigroup. SAME FOR WOOLIES IN THE SAME ORDER AND APPROXIMATE PERCENTAGE!!! The likes of JP Morgan, HSBC may also be holding them in trust or some such for others. The investment banks you mention may have shares in their own account but they also hold shares for other institutions, probably pension funds etc. The investment banks may not have any exposure to share prices, though the pension funds could lose their shirts if the bank goes under. Thanks guys. So “the nominee” concept is to insulate themselves from catastrophe, whilst shearing the sheeple on the sheeple’s behalf? ?